Good morning! I’m Jeanesse and I have been very blessed to have the opportunity to share with you this morning a little bit about what I learned and what I saw and experienced on this trip. It was my third time, actually, to be able to go to this country; and the Dominican Republic is a people and a country that is very near and dear to my heart. Although I’ve been there before, there were still lots of things to learn and experience this time around. And I haven’t been given a whole lot of time to share so I can’t even begin to tell you all the things that we did and saw. I think, in preparing for this, what the Lord was wanting me to share with you guys, is just how - the word that came to my mind was "joy." Before going on the trip, one of the things that I was thinking about before we left was how I wanted to learn how to be "joyful" again. And being there, and seeing those people, they are just full of "joy"— like overflowing with joy! And it’s something that I think you could really only get in a couple of different ways. At first I thought that it was just because of having very little materially. They were able to really just focus on God and I think that does play an important role. But also just being with them, and experiencing them, like I realized that they have a very profound faith — a faith that just — their lives are just centered around God! They have very little, monetarily speaking, but they are such a rich — a rich people and a rich culture, because they are full of God! And one of the things that we kind of talked about on this trip was that they don’t really expect life to be fair. We think according to our culture, we expect things to be fair and just, and we have these rights and we deserve this and that. But they don’t really see it that way — and life’s not fair! And so when times get hard their spiritual roots just go deeper and I think that allows them to be filled with this joy. And it just spreads to everyone that you encounter, like you just see them and they just have these infectious smiles and you can’t help to be, to feel what they are overflowing with. And they love extravagantly. Wherever we went to, we were just welcomed openly and they shared everything that they had with us. It was just beautiful! I think the last kind of little ingredient to this joy and love is their unity. They were so supportive of us, of each other, of everywhere that they went. They had church starts — and it wasn’t just a few people from their church going off and starting another church. When they had their services, a big group of the church would go out and support them, and help them, and be with them. If somebody else had something going on, a group of the church would go and be with them — like it’s a very relational culture instead of so goal oriented, and accomplish oriented, and deadlines and all those things. You really get to refocus your priorities in life, and spending time with people is one of those things! So, I’m not exactly sure where I’m going with this but I think those were some of the things that I wanted to share — it doesn’t even get to touch some of what we actually did! But I will save that for another time and some other people can fill you in on that as well. When, I said their lives are so centered around God — an example of that is in their greetings. Every time you go to church it’s "Diós te Bendiga!" which means "God Bless You!" And, to everyone you meet you say that and it’s not just— at first when you’re just learning what they do there and all that kind of thing — it might just be a phrase that you say. But really, it’s a blessing. It’s a real heartfelt "God Bless You." And then, when you listen to their conversations, like two people would be leaving for example and they’ll say- "Ok I’ll see you tomorrow" (then) "Si Diós desea" e.g. "If God wants - God is willing." It’s like "Ok, we’ll meet here tomorrow - if God wants", or "We’ll do this - if God wants" and it’s just a good reminder of how much they really depend on God. I don’t know, I almost think that’s the way it should be! And although we are very different in culture here and there — we look different, we speak different languages, we worship differently (which we can talk about a little bit later!) we are very much unified in Christ, we are very much apart of the same body, we worship the same God and we are brothers and sisters! So, that’s all I’m going to say for now! Este es el día que el Señor ha hecho! Last week, Jeanesse taught you to say "God bless you," in Spanish. I want to use this later, so let’s practice. Today I giving a report for Chris and me. We were thankful for this opportunity to visit our sister church and to serve them and our congregation and in this way. There is no way to tell all that happened and all we felt - You had to be there. But, so as not to disappoint you . . . I am prepared to share a couple of our highlights with you. First, I will share for Chris. You will not be surprised to know that Chris focused on the children. He wondered how they could look so happy in such poverty. Did they know they were poor? Was their joy a product of their parents’ joy in the Lord? But, the children at play showed no signs of the poverty in which they lived. They laughed and giggled and argued like children all over the world. Their clothes were hand-me downs and sometimes tattered, but their faces, their bashful smiles, were beautiful. Chris delighted in filming them, and they delighted in watching themselves on his video camera. Did they know they were poor? Was their joy a product of their parents’ joy in the Lord? For me, one of the highlights was participating in Love Feast with The Church of Living Waters. 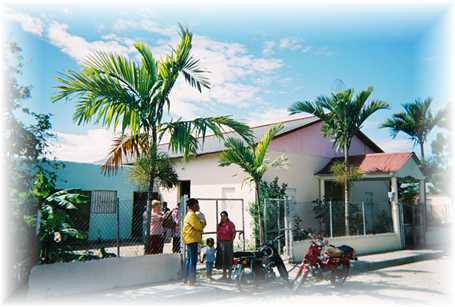 This is a new church, planted by our sister church, La Iglesia de Luz y Verdad. Of course, the food was very different. It was a chicken dinner served buffet style. Their church was just one room, the sanctuary. The chairs for that evening were set in a circle–in the sanctuary. So we filled our plates and returned to our places in the circle. I noted that there were only a couple of us, the Americans, in the circle, but, I figured, the hosts were serving or gathering up children, etc. Soon the circle began to fill with folks from the host church. We finished our meal and proceeded into the feet washing. It was beautiful all around. And so, the service ended and we said our reluctant farewells. Only later were we told that it was their custom NOT to eat in the church sanctuary. How caring they were. They joined us in eating in the sanctuary, rather than to embarrass us by asking us to move outside – which, of course, is where they were eating! What a lesson to us. Can we do that? Could we do that? Could we embrace a practice that is contrary to our own traditions for the sake of someone else’s tradition?